A trio of Victorian supreme court judges – Pamela Tate, Emilios Kyrou and Richard Niall – have validated the legal basis for a Freedom of Information determination by State Ombudsman Wayne Lines, which would see a review of the Keogh case conducted between 2003 and 2006 by then-solicitor-general Chris Kourakis finally made public. The review – which included a separate report by the state’s then-head of pathology Barrie Vernon-Roberts – was the basis of the former Labor Government’s decision to reject a petition for mercy by Keogh, who was jailed in 1995 for the drowning murder of his fiancé Anna-Jane Cheney. The Vernon-Roberts report was released to his legal team in 2013, and provided the basis for his successful case in the court of criminal appeal, which saw his conviction set aside before a subsequent retrial fell over. The Kourakis review has been the subject of a long-running Freedom of Information request by Channel 7, and its former news director and Today Tonight reporter Graham Archer. The network’s initial FOI request was knocked back, with the Attorney-General’s Department citing legal professional privilege. But an independent Ombudsman’s review overturned the department’s decision, with Lines finding legal privilege had been effectively waived because of detailed comments on the case at a 2006 media conference by then-acting Attorney-General Kevin Foley. Their decision, which Keogh described outside court as a “monumental” win, paves the way for SACAT to release the Kourakis review. 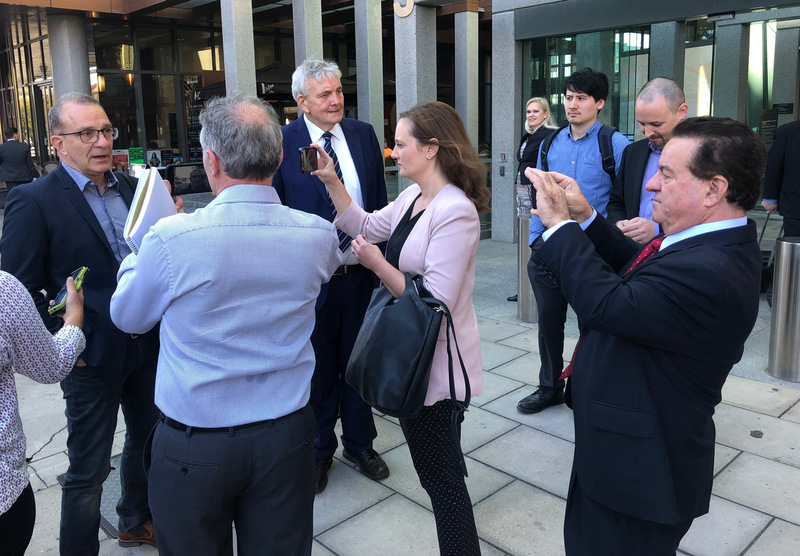 SA Best MLC Frank Pangallo – himself a former Today Tonight reporter – attended the hearing and said afterwards he would “be asking the Attorney-General to release the document immediately”. In a statement, Mealor said that the Full Court’s decision “addresses answers to questions of law referred to it by the SACAT [which] relate to technical legal issues about the construction and application of the Freedom of Information Act”. “Some of the questions concern an exemption in the FOI Act covering documents which are the subject of a claim to legal professional privilege,” she said. Keogh said outside court he did not dwell on the fact he spent almost a decade longer in jail before the Vernon-Roberts report was released. “I’m resigned to that – I’ve made my peace with the delay… because to continue to carry that around is not going to help me or the people around me,” he said. “But I’m hopeful this is going to be the watershed that will change the way criminal law is practiced… not just in SA, but right around the nation. He said “at every stage” of the process the request for information had been met with “obfuscation” and “legal manoeuvring”. “I’m not the only person this has ever happened to, and I don’t believe I’ll be the last,” he said. “It’s endemic across the country, and across the world… it’s a sad indictment on our justice system when we have to fight tooth and nail just to get to the truth. Archer said it was important to see the advice provided to the State Government to know whether the Vernon-Roberts report was “ignored… or not given sufficient weight”. He said this was a significant milestone in an FoI battle that he began in 2007. “It’s a significant decision, because people need to know what goes on behind the scenes about issues of public justice and fairness,” he said. Kevin Foley, who was acting-Attorney in place of Michael Atkinson when the appeal for mercy was rejected in 2006, could not be reached today but told InDaily in January he was “very comfortable with what I said back in ‘06”. “I was relying on advice, and I’m able to make my own conclusions on that advice, which I did ultimately – if someone wishes to challenge that they have every right to do so,” he said. He said the question of whether the Kourakis review should be released was “a matter for the Government of the day” but that he was “relaxed” about it. “There’s nothing in the report that I believe would cause me or the previous government any angst at all,” he said.